Do you hate trying to pull the cord to turn your ceiling fan on and off? Some of us are just too short, and it can be particularly difficult for children to reach the cord. Standing on chairs to reach it is just too dangerous, especially for children or seniors, so there needs to be an alternative to the traditional pull cord. 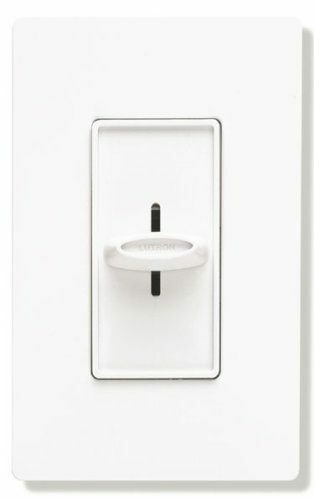 Luckily, there is, and it comes in the shape of a control switch that is on the wall, just like a regular light switch. Today, we are going to review five of the most popular ceiling fan wall control switches, and give you the information you need so you can get the best one for your needs. 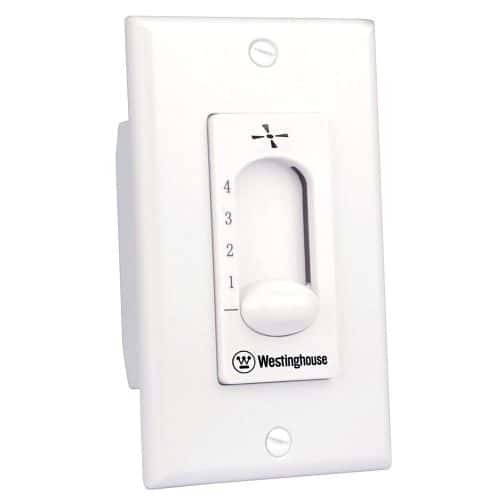 The Westinghouse 7787200 ceiling fan wall control has a ceiling fan variable speed control with up to four fan speeds, and it replaces the traditional toggle switch, so all you have to do is use the sliding switch that is right on the wall. You will never have to stretch to reach that pull chain again to control your fan. This switch is easy to control, with a two-wire installation. Easy Installation – This is UL and CUL-listed. It is 120-volt/60-hertz, and it can handle a fan with a maximum of 1 ¼ amps. A wall plate is included, which easily screws on after the two wires are connected. 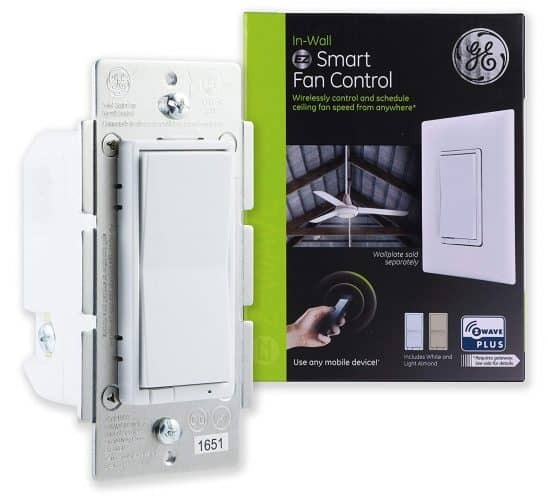 In the Box – Your ceiling fan wall control comes with the wall plate, and the wires are all there so all you have to do is shut off the power, and connect this control switch to an existing light switch, and then put the wall plate in place. Compatibility – This ceiling fan control switch is compatible with most types of ceiling fans, so you don’t have to spend a lot of money on a new ceiling fan. And, you can upgrade from a three to a four-speed fan just by using this switch. 1 or 2 Pack – More often than not, you are going to want multiple speed control switches for around the house, handily, with the Westinghouse 7787200 you have the option to purchase a single or double pack. Trusted Brand – When it is made by a trusted brand like Westinghouse, you know you are getting a quality product. Westinghouse is well-known for their ceiling fans, lighting fixtures, and other lighting products, which are all designed to be innovative, high-quality, and reliable. Easy to Use – You don’t have to reach for chains any longer. This ceiling fan control switch is easy to use, and you can set it for one of four speeds so you can get a little bit of air circulation, or a lot. Switches – Some users report that they have problems with the actual switches. Some are far too loose, while others are tight and difficult to move, making it hard to get the settings they want for their desired fan speeds. If this happens to you, we recommend firstly, checking it is installed correctly and if that is not the issue, sending the unit back for a replacement. 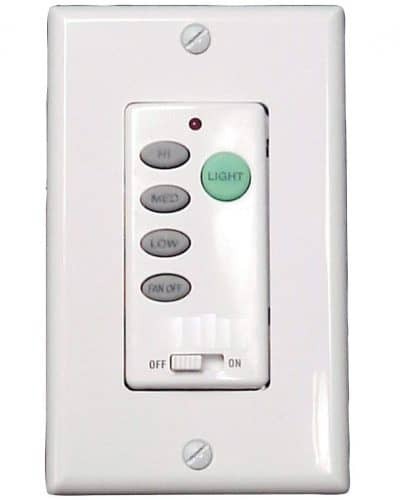 The Lutron SFSQ-FH-WH slide-to-off fan speed control switch is designed to be used with one ceiling paddle fan. This controller is white in color, and it gives you three speeds to choose from. It has a 1.5 amp maximum capacity, and you can purchase the coordinating Claro wall plates separately if you want to get the look of stainless steel. Quiet – Some switches give off a humming noise that can be rather annoying. There is no added noise when you install and use this Lutron ceiling fan control. It isn’t going to stop any noise that the fan itself may make, but it won’t create additional noise either. 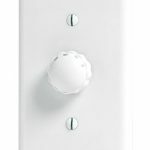 Appearance – This is an attractive switch, white in color so it will work in any room in your home. There are other models available, including stainless steel, and the Eco-Dim model with a dimmer switch. 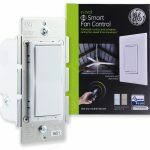 Easy to Install – It only takes a few minutes to install this ceiling fan control switch. But, if you are not familiar with basic electricity, it is a good idea to hire an electrician to install it instead. It’s better to be safe than sorry if you are unsure of what you are doing. 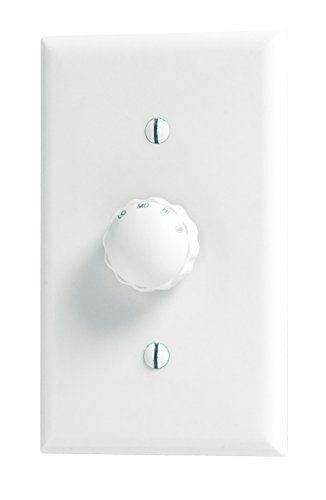 Easy to Use – The settings on this ceiling fan control switch are easy to use. You can choose from three speeds, on, and off, and there is nothing more to it. This is great if there are children in the home, because not only are they not tugging on the chain, this is easier for them to use. Everything Included – Everything except the tools is included in the box, so you don’t have to go out and buy any extra hardware. You can install this ceiling fan control switch right out of the box. One Fan – Some control switches can be used to control multiple fans, but this one is just for a single paddle fan. If you need to control multiple fans from one switch, we recommend the Hunter 27180. There are ceiling fan control switches, and then there are ceiling fan control switches! The GE Z-Wave Plus is different from other control switches out there. This wireless smart control can be the beginning of the transformation of your home into a smart home. You can use it to program when you want the fans in your home to turn on or off, rotate faster or slower, etc. Improved Technology – This is an upgrade, with up to 50 percent improved wireless range than classic Z-Wave products, as well as having 400 percent more memory and energy efficiency, and a 250 percent faster processor. 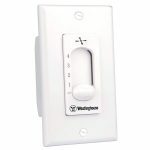 Compatibility – This ceiling fan wall switch is compatible with a number of brands that have a Z-Wave certified gateway, including SmartThings, Pulse, Trane, Nexia, Smart Security, Homeseer, Honeywell, Vera, Iris, Connect, and Harmony Home Hub Extender. It works with Alexa for voice control, but the hub, which is sold separately, is needed. Wireless Controls – You can wireless-ly control your ceiling fans from anywhere in the world when you use this smart ceiling fan control switch. It replaces most standard wall switches, and features a three-speed control system. 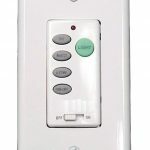 Device Compatibility – You can use this ceiling fan wall control switch with most wireless devices, including smartphones, tablets, and Z-Wave wireless remotes. You can also control this switch from your PC. Performance – Most users report that they have no problems with this control switch, and that it works flawlessly. They also report that they never have to adjust for daylight savings time changes, or for any seasonal changes. Installation – Some users have reported that this switch can be tricky to install, because there is not enough space between the screw and the housing around it to get the wires in. The Hunter 27180 is a two-wire fan control that operates up to three fans at once at high, medium, and low speeds. This switch allows for quiet fan operation, and isn’t going to cause any additional humming noises. It can easily be installed in any standard, two-wire wall switch, so no additional wiring is necessary. Of course, it is recommended that you hire electrician if you are not experienced with electrical work. Easy to Use – This is a ceiling fan with variable speed control switch that is easy to use, as well as easy to install. It can operate three fans at 1.6 amps. The rocker switch plate is not included, so you will have to buy that separately. Compatibility – This ceiling fan speed control wall switch is compatible with most ceiling fan models and brands, including Hunter. Once it is installed, you just turn on the fan and it is ready to go at any of the three speeds. No Noise – There is no humming noise, no matter what speed you have your ceiling fans turned to. This switch offers a quiet operation, so the only noise you hear is the spinning of the fan paddles. Easy to Install – With only two wires for the ceiling fan wall switch wiring, it only takes a few minutes to install this switch and get your fans up and running without having to use the pull chain. Turns off Easily – If you don’t want to use the fans, you can easily turn them off with this ceiling fan speed controller. All you have to do is turn it all the way to the left, and the ceiling fans will shut off. Defective Product – One or two users report that they received defective products, however, if this happens to you, simply return and get a replacement. The Litex WCI-100 Wall Command Universal Ceiling Fan Control offers three fan speeds (low, medium, and high), as well as a full range dimmer. There is also an instant off button so you don’t have to keep pressing a button repeatedly to get the fan to stop spinning. This control works with down rod mounted fans, flush mounted fans, and vaulted positions. Easy Installation – This is a simple, two-wire installation that comes with the wall unit and a receiver. 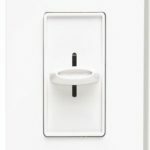 You can install this switch in just a few minutes, but it is recommended that you have an electrician do the work if you are not experienced with electricity. Compatibility – You can use this switch with just about any brand of ceiling fan. The two wires to connect are the same as they would be with any switch that is already in your home, so there is no need for any re-wiring. Use Outdoors – You can use this fan for your outdoor space as well as indoors. The switch can communicate with the fan from other rooms, even if it is 20 feet away from the fan, and through exterior walls. Controls – The controls are easy to use, and the dimmer function lets you enjoy various types of lighting. Warranty – This wall switch comes with a one-year limited warranty protecting you against any manufacturer defects. If you have any issues with this switch, contact customer service to ask for a refund or replacement. Logo – Some users have reported that they do not like the fact that the Litex logo is prominently located on the front of this switch, in black ink so it really stands out. Your ceiling fans have never been easier to use, once you have any of these ceiling fan control switches installed. If you not sure how does a ceiling fan speed control work, make sure to consult your user manual. Look for one that controls more than one fan if possible, and if you can afford the extra, get a smart switch so you can control your ceiling fans without actually having to be right in your home.